This sunny wedding invitation features a bit of a rustic flair in lovely floral illustrations and a touch of bright sparkle in crystals that embellish the stylized floral that sits atop the dotted border containing the event details. 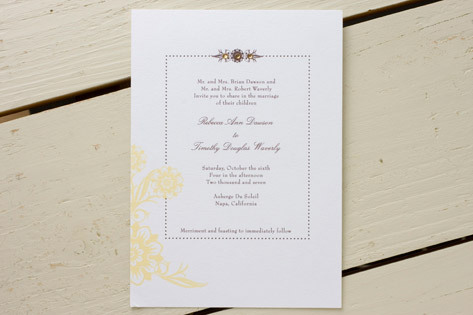 The invite's motif is echoed in the invitation envelope liner and on the pieces that complete the suite. Available in chocolate/butter (shown), chocolate/sage, chocolate/petal, and black/cloud.